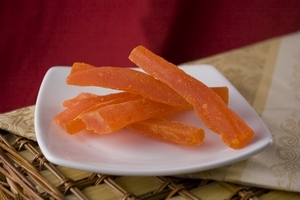 One taste of Dried Papaya and you'll quickly see what all of the fuss is about. It's like biting into a tropical vacation, with a deep orange color reminiscent of the island sun. 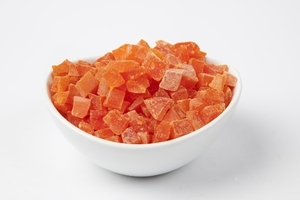 Enjoy the delectably complex flavor of dry papaya anytime when you purchase bulk Dried Papayas from SuperiorNutStore.com. Dried Papayas - think sun on your shoulders and your favorite memory of summer captured in perfect culinary form. Taste the tropics anywhere, during any season with Dry Papaya from the Superior Nut Company. Relax and savor a delicacy as engaging as a day in the island sun. Enjoy the complex flavor of these delicious dried fruits, or surprise loved ones with Dried Papaya as a thoughtful and elegant gift. These Dried Papaya slices are backed by our 100% Customer Satisfaction Guarantee, and we ship 99% of orders the same day to ensure optimal freshness. There is something infinitely satisfying about biting into the delectable, chewy, orange-hued slices of Dried Papaya.They are not only tasty, but also contain essential nutrients that contribute to an overall healthier body. Yummy, and packed with beta carotenes, vitamins C, E and A, flavonoids, folic acid, potassium and fiber. 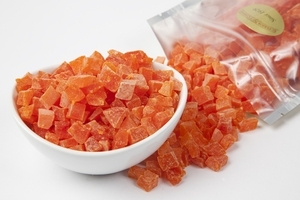 Dried Papayas can help reduce high blood pressure, contribute to cardiovascular health and even aid in digestion. Additionally, papayas are suggested to have anti-parasitic and anti-amoebic properties to help ward off bacterial infection. The possibilities for bulk Dried Papayas are endless! Dry Papaya is satisfying and flavorful as a snack on its own, but can be elevated to a dessert when dipped in creamy chocolate. Chop up and sprinkle over cakes, sprinkle minced Papayas over ice cream, or watch chopped Dried Papaya add zing to a Cobb salad. Dried papaya tastes divine in a chutney, or watch it transform into a savory treat when stuffed and baked in a meat like pork. Versatile and nutritious, this is a distinctive fruit that you will enjoy incorporating into your healthy diet.